EVENT: Is Hamlet guilty of first-degree murder for killing Polonius in his mother’s bedroom? Join us for an exciting mock trial to decide Hamlet’s fate. Hamlet’s lawyer, Song Richardson, dean of UCI’s School of Law, will defend the prince. The prosecutor, Erwin Chemerinsky, founding dean of UCI Law, and dean, Berkeley Law, will argue that the prince is responsible for his actions. INFORMATION: Free and open to the public. Visitor parking is available in the Student Center Parking Structure (grid D9 on campus map) for $10. Media planning to attend should contact Annabel Adams at 949-824-8925 or amadams@uci.edu. Parking is complimentary for media who RSVP in advance. HIGHLIGHTS: The Honorable Andrew Guilford, U.S. District Judge, Santa Ana Division, will bring order to the courtroom for this literary and legal adventure. Professional actors will bring the drama to life, featuring Zak Houston as Hamlet, Richard Brestoff as Polonius and Cynthia Bassham as Gertrude. The audience will vote on the winning argument and decide Hamlet’s legacy. 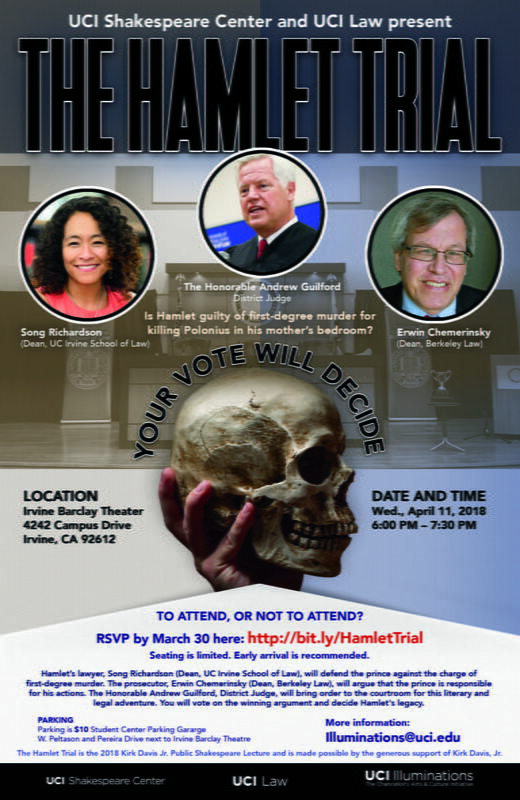 BACKGROUND: The Hamlet Trial, presented by the UCI Shakespeare Center and UCI School of Law, is the 2018 Kirk Davis Jr. Public Shakespeare Lecture. It’s made possible by the generous support of Kirk Davis Jr. For more information, visit http://bit.ly/HamletTrial.